This is the coveted Great Morel Trophy which is bestowed to the winner each month or winners will receive a selected item from The Morel Store. The rubber trophy is cast from an actual morel in The Great Morel’s secret underground lab. The morel stands about 5″ tall and worthy of any trophy case. Congratulations goes out Dave A of Indiana who submitted this photo which was selected as the winner. 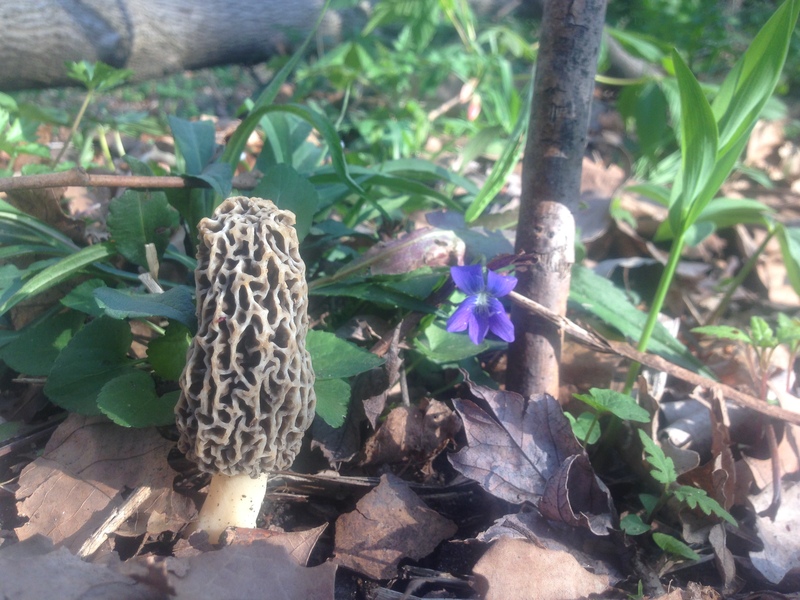 Dave hunts in Central Indiana just east of Indianapolis, and submitted this photo of a fresh grey morel along side a pretty wild violet. 1.First you will brine your morels in a cool salt water bath using water and salt. Your brine should be as salty as the ocean to properly do its job and you will need to let them soak for 30 minutes. Don’t be squeamish if this is your first time prepping morels, there will be little critters emerging from your mushrooms. This totally natural, the brine brings them out and with a quick rinse you will have nothing to worry about. 2.Mix your egg and milk in a bowl. 3.Mix your flour and spices in a bowl. 4.Melt your butter (or frying oil of choice) in a pan on Med/Low heat. Now you will begin by dipping your morels in the egg and milk mix and then rolling in your flour. I like to repeat this process a second time to create a nice crispy batter. Fry the morels slowly to ensure they get the proper steam to develop that lovely flavor and keep the stomach woes at bay. I like to aim for at least 6 mins each side. If your oil gets too hot remove the pan from your broiler and reduce the heat placing the pan back on the broiler once desired temperature is reached. Salt to taste and enjoy natures bounty!!! This shot was taken by Jason B of Lowell Arkansas who was selected the winner of the “Morels In Nature” contest. There were a lot of really great shots sent in and we think you’ll agree this is a worthy photo. Kiki L. receives the recipe award for contributing this recipe which should be on put in everyone’s cookbook! Also check out Maddie & Kiki – The Foraging Sisters on their Facebook page and their website MaddieandKiki.com and join in their adventures. Have you ever heard the age-old farmers phrase, ‘what grows together, goes together?’ Well this saying certainly rings true with this easy appetizer that is simple to make, but impressive enough for a fancy dinner party. With fresh wild turkey, asparagus and morel mushrooms, this appetizer is the epitome of Spring in one bite. Soak the morels in lightly salted water for approximately 15 minutes. Drain and rinse, ensuring to remove as much sand from the mushrooms as possible. In a small pan over medium heat, melt butter and add garlic. When you can smell the garlic (approximately one minute later) add the morels. Cook until there is no longer water in the pan, about 3-4 minutes. Season with salt and pepper to taste. Remove from heat, and set aside for assembly later. Place the liver in a small container, and cover with milk. Cover and refrigerate for 24 hours. The milk will draw out any overwhelmingly metallic flavors that liver can sometimes have. Drain liver, and pat dry with clean kitchen towels. In a medium-sized frying pan, cook the bacon over medium-high heat until crispy. Do not drain the remaining fat from the pan; this is going to add to the flavor and texture of the pâté. Turn the heat down to medium, and add the butter, celery, carrot, onion, garlic, liver and spices. Cook until lightly browned and aromatic, approximately 3-5 minutes. Add the wine, and cover with a lid. Turn the heat to low, and let simmer for 5-10 minutes. Remove from heat, and remove lid. Let cool slightly before adding to a food processor. Process until smooth. Spoon into a container, let cool to room temperature, and refrigerate until fully cool – a couple hours. Slice baguette on an extreme diagonal for long, dramatic slices. Toast slices. Smear a generous amount of pâté on the bread, and load on as many morels will fit onto each piece (and if some drop off onto the plate, your guests will NOT be unhappy about eating these on their own!). Use a vegetable peeler and shave the asparagus into long, thin strips. Haphazardly top each toast with a few strips of the asparagus for colour and a pop of fresh Spring flavor.